A variant of spasmodic dysphonia in which the spasms (and their effect on the voice) are sustained rather than intermittent. Tonic variant spasmodic dysphonia is to be distinguished from classic variant spasmodic dysphonia. Individuals with a tonic variant of adductor spasmodic dysphonia have a sustained strained-sounding voice. Individuals with a tonic variant of abductor spasmodic dysphonia have a voice that is more or less continuously breathy. Tonic variant spasmodic dysphonia goes undiagnosed or misdiagnosed far more frequently than does classic variant spasmodic dysphonia. At speech pitch of B3 (247 Hz), the not only true, but also false cords are continually compressed together and voice is very strained and pressed-sounding. Just a note higher, at C4 (262 Hz), false cords relax a little to reveal the true cords. An octave above, in falsetto, true cords are now nearly completely seen. Voice quality is less strained. This exemplifies the common but not universal finding that falsetto is less affected by the dystonia than chest register. 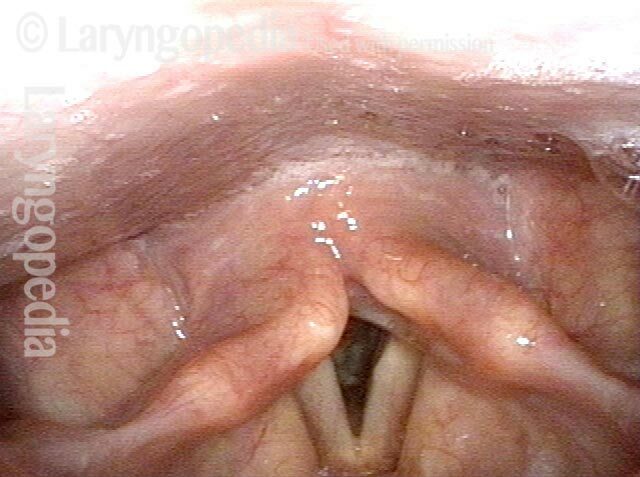 This patient's larynx also demonstrates marked adductory tone during breathing, though not to the point of classifying this individual as having a respiratory dystonia component. This entry was posted in Multimedia Encyclopedia and tagged Audio, Disorders, Neurological voice disorders, Voice & other larynx disorders by admin. Bookmark the permalink.